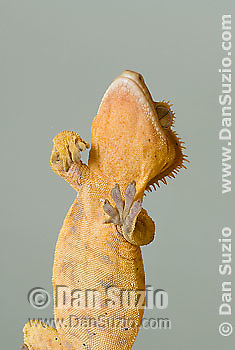 New Caledonian Crested Gecko, Rhacodactylus ciliatus, walking on vertical pane of glass. Microscopic setae and spatulae on the gecko's feet allow it to walk on almost any surface. Also called Guichenot's Giant Gecko or Eyelash Gecko. Endemic to New Caledonia in the South Pacific, the crested gecko was thought extinct until it was rediscovered in 1994. It is now one of the most commonly kept species of gecko in captivity. . Copyright © Dan Suzio, all rights reserved.